At the center of T-Mobile’s upcoming business move is a new way to get more families to switch to the T-Mobile network and away from its competitors. The carrier posted a tweet earlier this morning shows its 2013 and 2014 New Years resolutions. All of the things that were listed under 2013, were the changes made to the network as a result of its UnCarrier events. T-Mobile’s plan for unshackling families is reportedly going to be to pay off their early termination fees (ETFs) so that they can switch whenever without any trouble as a result of their current plans. Families may not be the only ones who are likely to see their ETFs paid, but they will receive more than if an individual were to try and switch, however individuals may not receive any ETF credit according to some sources. Families that switch from another carrier with at least 3 lines who have to deal with early termination fees will reportedly receive up to $350 from T-Mobile per account. This means that a family’s ETFs will not necessarily paid in full but the majority will be paid for T-Mobile to making the switch a little bit easier. 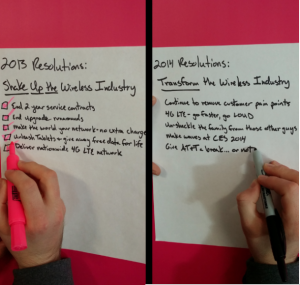 Legere should be announcing his goals with UnCarrier part 4 during CES 2014 in January. So, the details of his plan to “unshackle” families will be made public sometime this month once CES begins. T-Mobile has already brought major changes to the US carrier industry and as a result, it is not surprising that Legere and his company would introduce a plan to help people out with their early termination fees. Summary:T-Mobile’s John Legere is continuing to shake things up and is hinting at a plan to help families move to T-Mobile and away from a competing carrier. This plan may include T-Mobile paying off early termination fees.